The Budapest Burns Suppers have been growing and growing recently, and almost 350 people attended this year, a record turnout. Overall more than HUF 13 million was raised, which will be donated to the 2nd Department of Paediatrics in Tűzoltó utca, the Péterfy Children’s Hospital, and other projects to be announced over the coming months by the Robert Burns International Foundation. 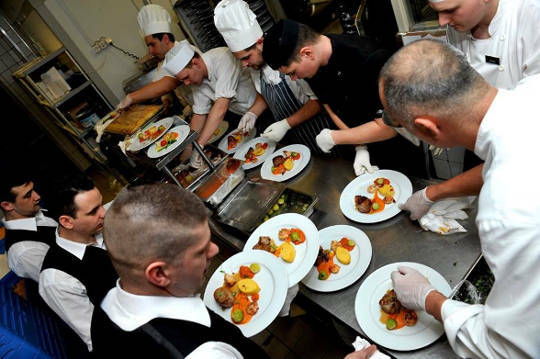 Just a few weeks after the festivities around Christmas and New Year, people are always ready for a party again, which makes the timing of the traditional Budapest Burns Supper perfect. The 21st annual event was held as ever in the amazing Ballroom of the Corinthia Hotel Budapest on 27 January 2018. As a Burns Supper there are many traditional elements, such as the Address to the Haggis, performed by the lead piper Rab Tait in his own inimitable way. Guests are also treated to Scotland’s national dish of haggis, neeps and tatties as a starter, with many asking for more! 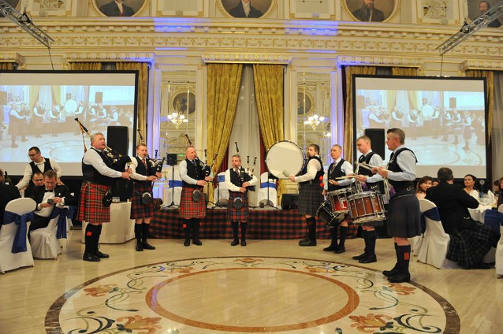 Over the years, DHL as a sponsor have brought over almost one and a half tonnes of haggis from Scotland to Budapest for the Burns Supper. This year guests were entertained by the fabulous singing and poetry recital of Sophie Craig, a 16-year-old girl from Alloway, who performed at Burns’ Cottage on the 25th before jumping on a plane to perform in Budapest as well. A real talent! The Budapest Burns Suppers have been growing and growing recently, and almost 350 people attended this year, a record turnout. The superb venue provides a great setting for some serious fundraising in the course of the evening. 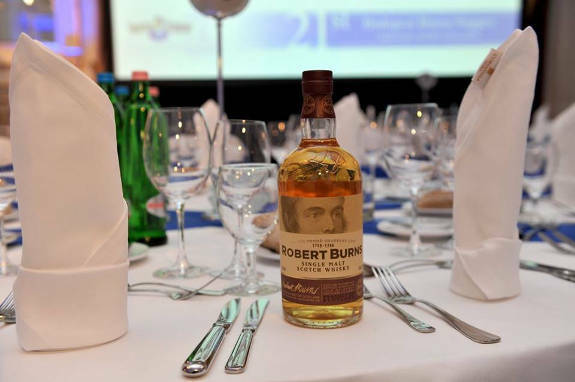 Overall more than HUF 13 million was raised, which will be donated to the 2nd Department of Paediatrics in Tűzoltó utca, the Péterfy Children’s Hospital, and other projects to be announced over the coming months by the Robert Burns International Foundation. Gold Sponsors: Corinthia Hotel, Budapest Airport, First-Med Centers and Woodbrook Wealth. Silver Sponsors: Qatar Airways, DHL and Diageo. Bronze Sponsor: Theodora Water, CBRE and Inter Relocation. The organisers would also like to thank WhiskyNet, Arran Distillery, CocaCola, Dreher, Volvo, Szent Donát Winery Babiczki Winery, Zwack, Nespresso, as well as all those who helped with the raffle and the auction. With so many people turning up, make sure you like the RBIF Facebook page to be sure of hearing all the details about next year’s event in good time, and to find out what projects the RBIF will be supporting throughout 2018! Feature image and all photos by Russell Skidmore. Previous articlePost-Brexit in Hungary: Keep Calm and Carry On?